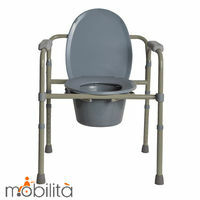 This chromium plated commode chair is ideal for in-house use for people with limited mobility. 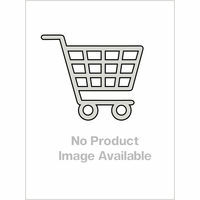 It comes with a easily removable plastic pail that can be washed effortlessly. 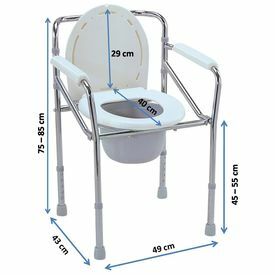 This commode chair can be used in the room itself (avoiding a trip to the toilet) or it can be positioned above the existing western closet without the pail. Ideal for using in the room as well as for placing over an existing western closet where the arm rests help in getting up and sitting down. It is foldable and easy to transport. 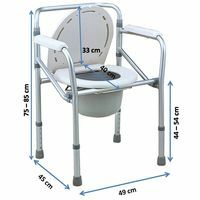 It is height adjustable, so you can ensure sitting comfort for people with different heights. 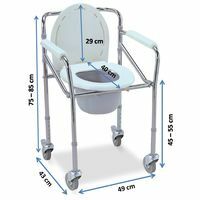 This chromium plated commode chair is ideal for in-house use for people with limited mobility. It comes with a easily removable plastic pail that can be washed effortlessly. 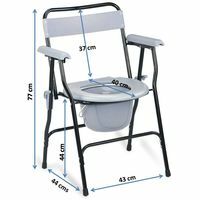 This commode chair can be used in the room itself (avoiding a trip to the toilet) or it can be positioned above the existing western closet without the pail. Ideal for using in the room as well as for placing over an existing western closet where the arm rests help in getting up and sitting down. 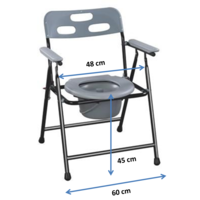 It is foldable and easy to transport. 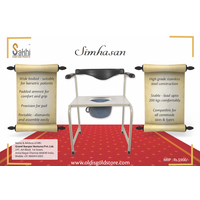 It is height adjustable, so you can ensure sitting comfort for people with different heights.